Buy Tingiringi GumHedge online from UK hedging supplier of cell grown hedges and trees. 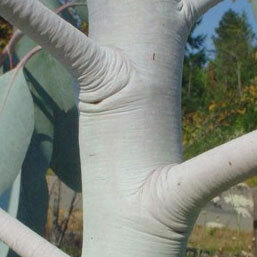 Tingiringi Gum (Eucalyptus Glaucescens) is an evergreen tree or shrub that is fast growing with some very attractive features such as grey/green to white peeling bark. The bark shreds in ribbons exposing a variety of colours. Young leaves will be blue/white turning blue/green when older giving off an pleasant smell when crushed. Creamy white and fragrant flowers are seen in small clusters around Autumn time. Native to South East Australia which could be politically controversial because all our plants are grown in the UK so technically speaking, just like immigrants who have children here, they are British? Just a thought. Considered to be broadly conical reaching a height and spread of around 12m and 8m at 10 years, although local conditions and weather will influence this heavily so could stop at that height or go on to be more, possibly over 25m. Growth of 2m a year or more can be expected. For those customers out in their garden with a calendar and tape measure, this is an average measurement! 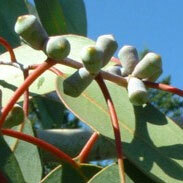 Moisture levels can affect Tingiringi Gum foliage density. Kept well watered in the Summer, you can expect a dense bushy crown but if deprived of water, you would see an open and not so dense crown. Good for bio fuel or biomass, whichever eco school of thought you are from. Coppices very well and good for specimen trees which means can be planted on its own for interesting ornamental benefits. Can also be grown indoors or containers but is slow to start. Foliage also used in flower arrangements. For best results plant in full sun with some protection from the wind although you can plant in exposed sites. Considered fully UK hardy which usually means will survive down to -15 degrees centigrade. If in doubt get your gran to knit a tree jumper which will obviously be outgrown in a few years. Will tolerate most soil conditions except those near Chernobyl or submarine window boxes. If you are going to use it for hedging or screening then we suggest plating distances of 1.5m or more. You can plant closer but these are very vigorous trees and they will compete for nutrients in the soil which may slow them down. Regular feeding for closely planted Tingiringi Gum (Eucalyptus Glaucescens) would be a good idea, certainly not a bad one.